The United States Congress designated the Ellicott Rock Wilderness (map) in 1975 and it now has a total of 8,300 acres. Georgia contains approximately 2,023 acres. North Carolina contains approximately 3,416 acres. South Carolina contains approximately 2,861 acres. It is managed by the Forest Service. Ellicott Rock Wilderness sits at the southern tip of the romantically hazy Blue Ridge Mountains. Congress designated Ellicott Rock Wilderness in 1975, later expanding it in 1986. The wilderness uniquely spans three states in Sumter, Nantahala, and Chattahoochee National Forests of South Carolina, North Carolina, and Georgia respectively. It is named after Major Andrew Ellicott who was tasked with the arduous job of locating the 35th parallel to settle a border dispute. On December 26th, 1811, Major Ellicott inscribed the letters "N-G" on a rock along the Chattooga River bank declaring the Georgia-North Carolina border. Ellicott Rock Wilderness has a temperate climate with an average rainfall of 80 inches per year creating a dense forest with steep, rugged terrain. The landscape is largely covered in a variety of hardwoods, white pines, and hemlocks with bountiful water sources weaving throughout. The untamed Chattooga Wild and Scenic River runs through the heart of the wilderness and is one of the longest and largest free-flowing mountain rivers in the southeast. The wilderness provides visitors with bountiful opportunities to experience solitude and see an impressive array of plant and animal communities while hiking, camping, hunting, fishing, swimming, or kayaking. 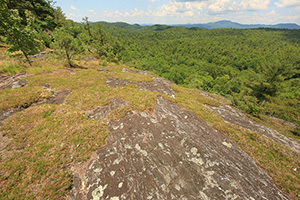 Ellicott Rock Wilderness maintains 18 miles of hiking trails with trailheads in both South Carolina and North Carolina. In South Carolina, the highly trafficked Chattooga River Trail (4 miles) and East Fork Trail (2.5 miles) join together and lead you down to Ellicott's Rock itself. For a quieter and longer traverse to Ellicott Rock, you can hike along the winding Fork Mountain Trail (6 miles) that shares a junction with the Ellicott Rock Trail of North Carolina. To find the best opportunities for solitude, access Ellicott Rock by hiking along the Ellicott Rock Trail (7 miles) in North Carolina. The trail has two trailheads along Bull Pen Road and crosses the Chattooga Wild and Scenic River in the middle. Be aware, Ellicott Rock is not visibly marked and can be difficult and dangerous to find. Kayaking the Chattooga Wild and Scenic River is also a scenic, secluded, and adventurous way to experience Ellicott Rock Wilderness. Paddlers may access the river at designated locations, during the boating season (December-April), and when water levels reach 350 cfs or greater. Plan ahead and prepare for your adventure in Ellicott Rock Wilderness and don't forget to Leave No Trace. 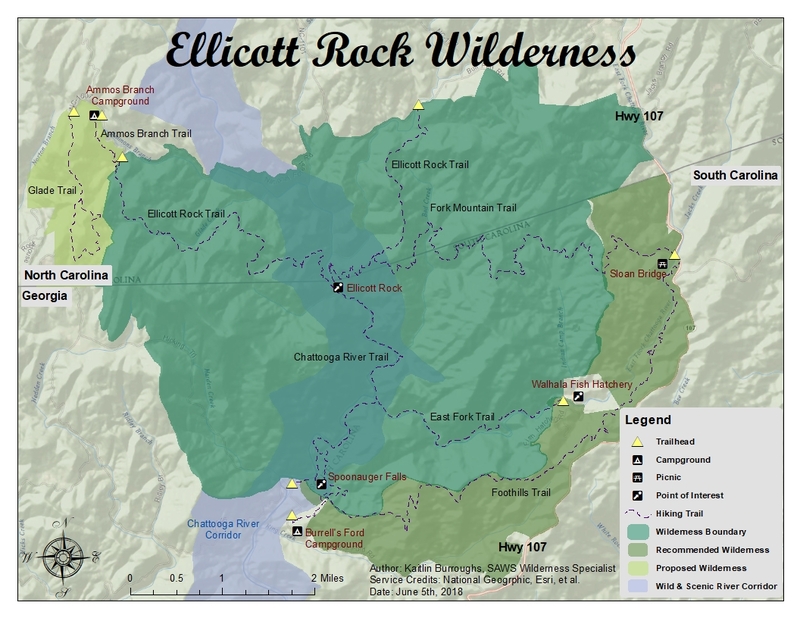 Planning to Visit the Ellicott Rock Wilderness? How to follow the seven standard Leave No Trace principles differs in different parts of the country (desert vs. Rocky Mountains). Click on any of the principles listed below to learn more about how they apply in the Ellicott Rock Wilderness.